Medical ultrasound is based on the use of high-frequency sound to aid in the diagnosis and treatment of patients. Ultrasound frequencies range from 2 to approximately 15 MHz, although even higher frequencies may be used in some situations. The ultrasound beam originates from mechanical oscillations of numerous crystals in a transducer, which is excited by electrical pulses (piezoelectric effect). The transducer converts one type of energy into another (electrical <--> mechanical/sound). The ultrasound waves (pulses of sound) are sent from the transducer, propagate through different tissues, and then return to the transducer as reflected echoes. The returned echoes are converted back into electrical impulses by the transducer crystals and are further processed to form the ultrasound image presented on the screen. Ultrasound transducers contain a range of ultrasound frequencies, termed bandwidth. For example, 2.5-3.5 MHz for general abdominal imaging and 5.0-7.5 MHz for superficial imaging. Ultrasound waves are reflected at the surfaces between the tissues of different density, the reflection being proportional to the difference in impedance. If the difference in density is increased, the proportion of reflected sound is increased, and the proportion of transmitted sound is proportionately decreased. If the difference in tissue density is very different, then the sound is completely reflected, resulting in total acoustic shadowing. Acoustic shadowing is present behind bones, calculi (stones in kidneys, gallbladder, etc.) and air (intestinal gas). Echoes are not produced if there is no difference in a tissue or between tissues. Homogenous fluids like blood, bile, urine, contents of simple cysts, ascites and pleural effusion are seen as echo-free structures. The EFSUMB provides excellent #FOAMed #FOAMcc #FOAMus #POCUS information on medical ultrasound. 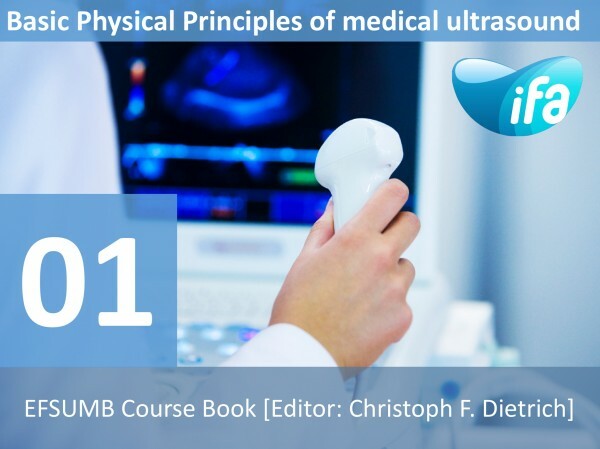 Below you can find a link to the original EFSUMB webpage to view and download different chapter on medical ultrasound.